Palma de Mallorca is the only real city on the island of Mallorca. Mallorca is one of the Balearic Islands off the Spanish east coast. Palma de Mallorca is the capital of the Balearic Islands and it continues to grow as a popular tourist destination in the area. The most popular time to visit is between April and October and visitors come from around the world to vacation here. The city has a growing number of major hotel chains and tourist shops. Despite the continual commercialization of the area, much of the city's original charm and character remain. The Old Town has quaint narrow streets and there's a beautiful restored cathedral at the center of town. If you're going to be visiting the area during the peak season then early reservations are recommended. This is particularly true over European holidays. During the winter months many hotels and hostels close, so reservations are advisable during those times as well. There some good hostels in and around Palma de Mallorca. Whether you're looking for a social setting or a more peaceful and relaxing place to stay, you'll likely find something that appeals to you. How much do hostels in Palma de Mallorca cost? Hostal Atlanta is one of the most popular hostels in Palma de Mallorca. It's located in the heart of Arenal and is a great value for the money. It's also in a great location near many different bars, restaurants, and clubs. It's about a ten minute drive from the airport and is just a five minute walk from Playa de Palma Beach, which spreads out over four miles. There's also a nice seaside promenade that you can walk along. In the nearby area you'll find Palma Aquarium, Aqua land waterpark, Palma de Mallorca Cathedral, and much more. The staff here are friendly and can help you arrange any number of tours or excursions to explore the area. There's a tourist office in the front of the hostel that specializes in offering great tours and activities for guests. If you're traveling alone or are on a tight budget, there are five bed dorms available for a reasonable price. There are also single, twin, double, three bed, and four bed private rooms available. Some rooms use shared bathrooms while others have their own attached private bathrooms. Prices are reasonable. The Hostal Tierramar is another popular hostel in Palma de Mallorca. It's a great value for backpackers and budget travelers and is located only thirty meters from Playa de Palma Beach. It's also about a 25 minute bus ride from the Old Town and city center. This hostel is a friendly and relaxing place to stay. It has a lively bar where you can enjoy cold drinks and light snacks and there are often other young backpackers and travelers hanging around so it's not hard to make a few friends while you're here. At times it can feel a bit like a hotel, but the staff are friendly and will go out of their way to help you with information or directions. There are 28 guest rooms in total that include singles, twins, and triples. Many rooms have their own balconies and all of the rooms have been renovated and have private bathrooms. Superior rooms have air conditioning. There are also six bed apartments available. A good hostel for people who want to explore a small town and a more natural setting. 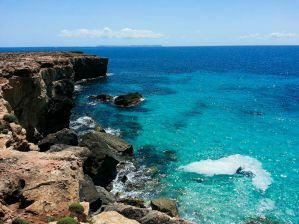 Sa Fita Backpackers is another good option for budget travelers but it's actually located outside of Palma de Mallorca. It's a great place to base yourself is you want to enjoy the area's wildlife, cycling, and natural scenery. It's located in a traditional Mallorcan house in a quiet small town in the heart of the Serra de Tramuntana. This hostel and the town of Esporles are about half an hour outside of Palma de Mallorca. The town has several good markets, pubs, and restaurants. This is also a great area if you want to explore the natural setting on foot or with a bicycle. It's about a ten minute drive from the beach Port d'es Canonge. The hostel has shared rooms available that sleep six, eight, or ten. There are also single rooms available if you're traveling alone and want a little more privacy. In total there are only eight rooms, so the house has a very personal feel. The rooms are large and bright, and they offer impressive views of the Serra de Tramuntana. If you want to stay in a scenic and beautiful area that let's you explore the outdoor setting, then this is the place to come. It will give you a unique experience in the area.